We believe inspiration comes through action, and that health and fitness can give you super powers! 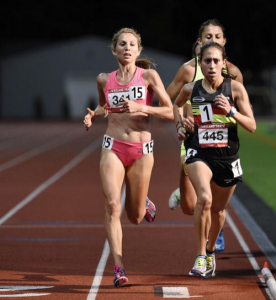 Natasha takes this ethos seriously in everything that she pursues–her professional running career (she placed third in the 10K in a stacked field at Portland Track Festival, pictured above), her marketing and PR work at SMACK! Media and her passion behind 2nd Recess, the non-profit that she co-founded with her husband Marco. 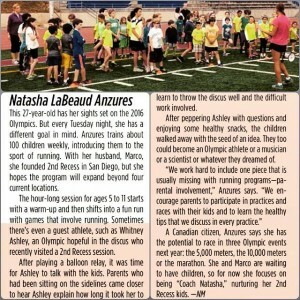 Natasha gives us the inside scoop about how she turned her passion for running into an amazing tool to fight childhood obesity and to improve the health, confidence and motivation of the next generation. Where did the idea to start 2R come from? 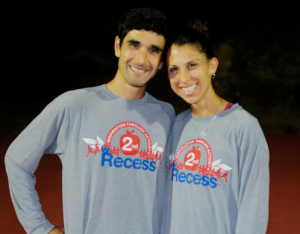 In college, I had the idea to start a non-profit organization called 2nd Recess to help reduce rates of childhood obesity through running. When (my husband) Marco and I were running one day in Flagstaff, Arizona, I told him about the idea, and we decided to take our passion and apply it to creating the program in San Diego in 2011. What happens during a typical 2nd Recess session? 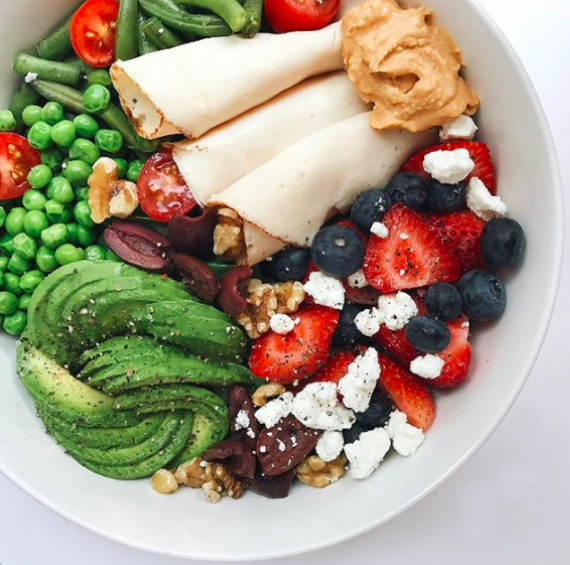 The typical practice will cover warming up and stretching, one or two running activities or a workout, a cool down and stretch, and finally a healthy snack to wrap things up before check out. During the practice, the children will learn the importance of staying active and eating well while also discovering how fun and exciting running can be. 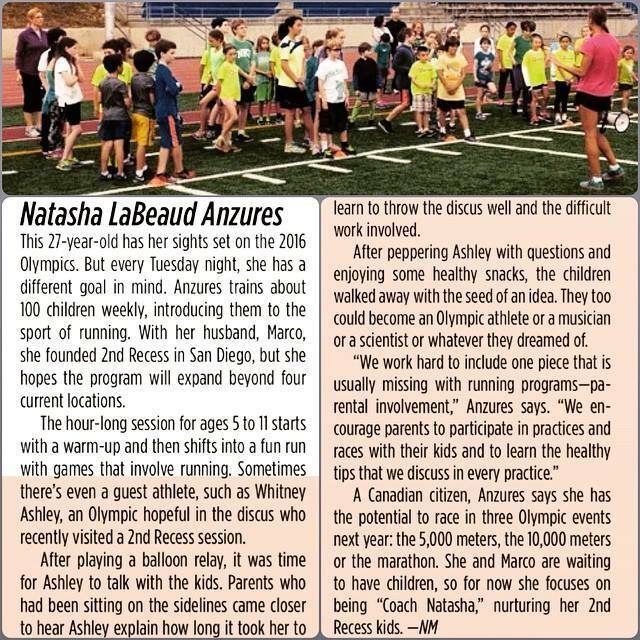 It is the goal of 2nd Recess to have kids come away from the program with a basic understanding of healthy habits and a new sense of curiosity for the sport of running. We meet at 3 different locations in San Diego currently (University City, Chula Vista, and Balboa), but have interest for many more sites in East County starting in the fall. We meet in the afternoons and early evenings for one hour at each location, one time per week. What is the age span of the kids? We work with kids as young as 4-years old to 13 year olds. Do they enter races? Or do you host events for them? We have partnered with many different local races that offer discounts for the members of 2nd Recess. 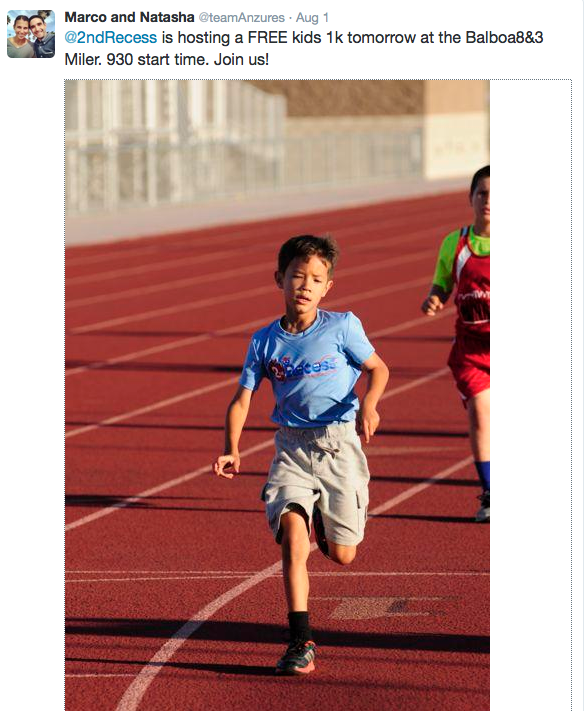 In addition, we host many races throughout the year in conjunction with San Diego Track Club events including the “Dirt Doggies Cross-Country 2k,” kids’ track races at each of the 4 summer nights track and field series meets and the Balboa 1000m for kids in conjunction with the Balboa 8 and 3 Miler. 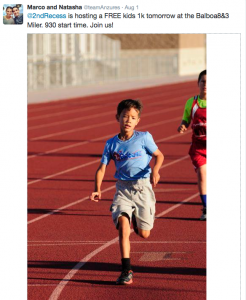 You began running as a kid, talk about the opportunity to get the younger generation hooked on running? I began running when I was about 6 years old, and have always understood the impact of physical activity in bettering my life. I am passionate about finding ways to address childhood obesity, and believe that teaching kids the ways to incorporate exercise into daily life in fun ways is necessary. I want kids of all ages to find ways to love exercise, whether it be running, or anything else, that keeps them moving for a lifetime. How do you see the translation of being a lifelong runner not only to your pro running career, but work at SMACK!, lifestyle and personal life? Running has taken me to some many places (both literally and figuratively). It has taught me discipline, and the importance of applying the 3 P’s (Patience, Positivity, and Perseverance) to every part of my life. Those skills are so hard to master, and you truly have to apply them constantly to achieve greatness in anything that you do! What is the toughest part of working with the kids? For example, how do you handle the kids who don’t want to run/like to run/or are having a bad day. Sometimes the kids can be really tough on themselves, and even start self-criticizing themselves out loud. You never want to see kids (or anyone else for that matter) beat themselves up, so translating that running is hard but rewarding can be difficult to share. When this happens, we work with the kids to show them what they are doing well, and tell them that we all have to work hard to reach our goals. Kids are resilient though—it doesn’t take long for them to hit the ground running again (usually a few minutes)! Check out Natasha, Marco and 2nd Recess in the recent issue of Women’s Running. To follow and support 2nd Recess follow them on Twitter and Facebook. For fun updates on the running, racing and married life of Natasha and Marco (“Team Anzures”), follow them on Twitter and Instagram.